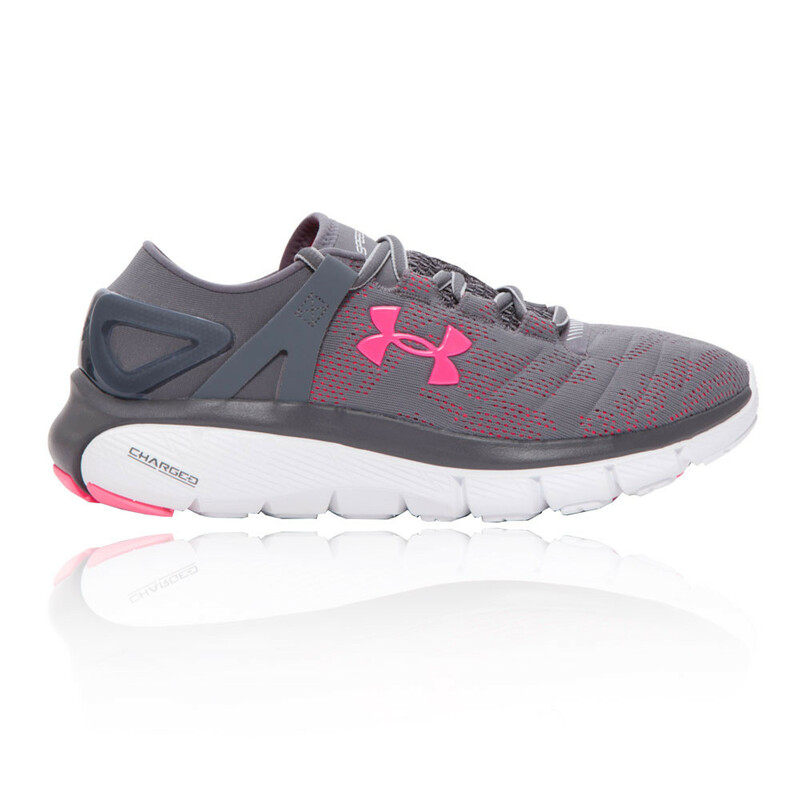 Run with comfort and confidence in the Under Armour Speedform Fortis Vent. ArmourVent technology in the upper provides exceptional breathability and moisture control, while the Charged cushioning midsole improves responsiveness. Solid rubber comprises the outsole for optimal grip and traction. The upper of the Speedform Fortis Vent is constructed using Under Armour's signature ArmourVent technology for exceptional moisture-wicking and breathable properties to ensure your feet remain cool and dry whilst you run. ArmourVent works by actively and efficiently wicking away the build-up of excess sweat and moisture as well as encouraging cool air to circulate, creating a drier, healthier environment for your feet to thrive. In addition to providing moisture-wicking properties, the upper is extremely lightweight with a stretchy jacquard knit fabric to deliver a full, unrestricted range of motion in all directions. Further protection is provided by the 4D foam, embedded within the sockliner for added cushioning and seamless comfort. Innovative SpeedForm technology delivers zero distraction as you run, helping you to maintain focus and performance as you strive for the best results. A seamless heel cup with silicone grip offers a locked-in, anatomical fit while an adjustable lockdown heel strap improves the fit of the shoe. Smooth, ultrasonic welded seaming with Bemis tape offers a next-to-skin fit and unrivalled comfort to help improve performance. Your safety and visibility are significantly improved in low light conditions such as early morning or evening runs when the light is at a premium thanks to reflective details, giving 360-degree reflectivity. Exceptional cushioning is delivered thanks to the Charged Midsole. The midsole works to combine areas of cushioning and support to comfortably absorb impact, meaning whenever you land the risk of injury is reduced as the shock is absorbed and gradual wear and tear on the joints is diminished. Added cushioning in the heel and strategic flex grooves situated in the forefoot work with your natural stride to improve gait efficiency. Solid rubber is used within the outsole, especially in high-wear areas for dependable, reliable traction on a plethora of surfaces to give you confidence in the shoe as well as being able to perform at your optimum level even in difficult conditions. ArmourVent Upper - Improves breathability and ventilation. Stretchy Jacquard Knit Fabric - Helps to deliver a full range of motion. 4D Foam - Embedded within the sockliner for added cushioning and comfort. SpeedForm Technology - Delivers zero distraction as you run. Seamless Heel Cup - With a silicone cup for a locked-in, anatomical fit. Adjustable Heel Strap - Improves the fit of the shoe. Charged Cushioning Midsole - Enhanced cushioning and comfort. Strategic Flex Grooves - Situated in the forefoot to improve mobility and gait efficiency. 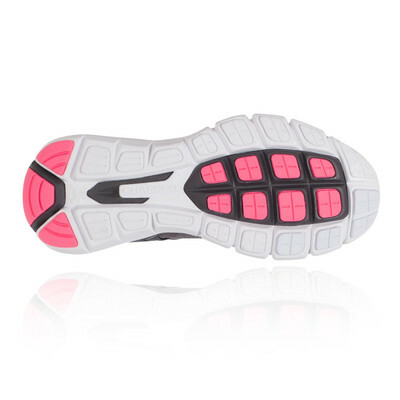 Solid Rubber Outsole - Offers grip and traction.